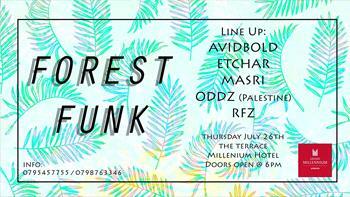 AMMONNEWS - For one Day and one Night only, in the heart of Amman, we’ll be taking over The Grand Millennium Terrace to bring you an event infused with funky sounds and an ultraviolet forest theme on the 7th floor, overlooking our beloved city. We invite you to help us bring the earthy space to life by enjoying 10 hours of non stop music in the midst of our forest. Drinks will be sold for very reasonable prices.